We know well, the cardiovascular and psychosocial benefits of frequent cycling. However now there are recent medical research forays to examine cycling and possible health effects for some other long-term disorders and diseases. Cycling in Saint Raymond du Port-Neuf, Quebec. 2009. Photo by J. Becker. Man was observed walking with his cane which he later stowed in his rear bike carrier before he cycled away. Recently the New York Times republished a remarkable video from the New England Journal of Medicine and an article about some patients with Parkinson’s disease, who were able to ride a bicycle even though they had difficulty standing or walking. The video documents a Parkinson’s patient who rides his bicycle regularily for 10 miles. Yet the 58-year old man could barely stand or walk without trembling greatly and collapsing onto the ground. Researchers posit a neurological coping mechanism in some Parkinson’s patients, “ kinesia paradoxica”, may be triggered “by the bicycle’s rotating pedals, which may act as an external pacing cue”. Similar observations were made for 20 other Parkinson’s patients. It is hopeful work which may benefit some patients. After I forwarded the NY Times article to other people, a woman indicated that health care staff already had her husband, who has Parkinson’s, unsuccessfully cycle a recumbent bike. 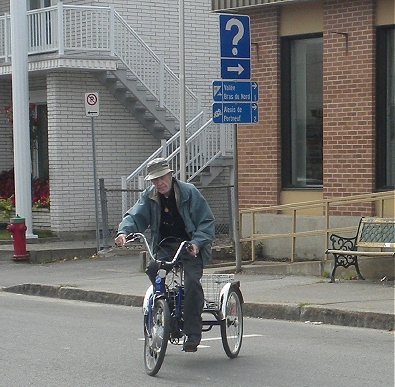 It was not clear if her husband rode a recumbent bike in the past. At this time, Jack Layton, federal leader for the Canadian NDP political party and long time cyclist, is participating in a medical research study for prostate cancer patients to determine if cycling and other regular exercise can mitigate tumour growth. The research project, Survivorship Exercise Program is based at Princess Margaret Hospital, a lead cancer hospital in Toronto. J. Layton has been undergoing radiation treatment. 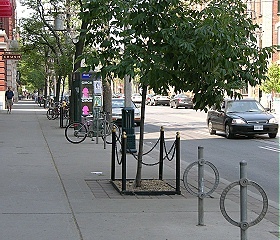 For over 20 years, which included his tenure as Toronto city councillor, J. Layton constantly advocated for cycling facilities. For many years he also chaired the Toronto Cycling Committee and its predecessors. The story has been that over a drink of beer, J. Layton designed on a napkin the now well-known Toronto post and ring for parking bikes. Now there are approximately 18,000 of these post and ring installations. During part of this time, Jack Becker of Third Wave Cycling Group had the pleasure of serving as his public co-chair from 1995 to 1999. Kolata, Gina. 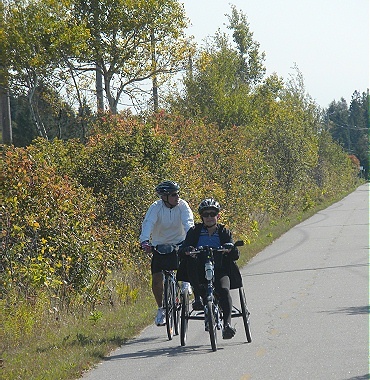 “For Some, Cycling Provides a Break For Some with Parkinson’s Disease.” In New York Times. Mar. 31, 2010. Savin, Monique. “Studying Exercise and Cancer –with Jack Layton’s Help”. In Globe and Mail. Mar. 25, 2010. Snijders, Anke J. and Bloem, Bastiian R. “Cycling for Freezing of Gait”. In New England Journal of Medicine. Vol. 362; (e62). No. 13. Apr. 1, 2010.